In this post we head back for the final days of the Bay Area Equestrian Club’s Vet Camp. Day four began with campers designing their own equestrian centre. 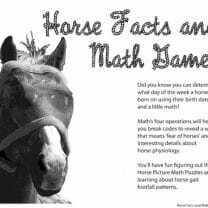 You need math to stay within your budget and calculate what it will cost to build an equestrian centre or vet hospital. 1. If you designed a 10 horse barn with base dimensions of 36 ft (11 m) by 84 ft (26 m), what is the perimeter of the barn? 2. What is the area of the barn? 3. To calculate the amount of wood you would need to build the exterior (outside) walls, would you use the area of the barn or the perimeter? A form of yoga created specifically for horseback riders was taught in the barn. Good thing this barn has a super-wide isle! A standard size for a box stall is 12 ft (3.7 m) x 12 ft. (3.7 m). 4. How many stalls would fit down the length of an 84 ft (26 m) long barn? 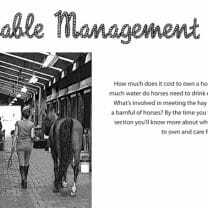 Of course barns and stables need more than just stalls. Caden explains, “You may have a tack room and closet in the barn and you may also need enough room for a hay loft or a grooming stall. Campers also learned about pasture and paddock size. 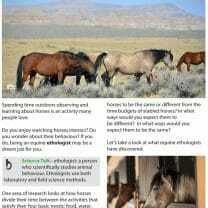 For example, each horse should have approximately ½ acre of space to roam. 5. Is ‘acre’ a measure of area or perimeter? 6. 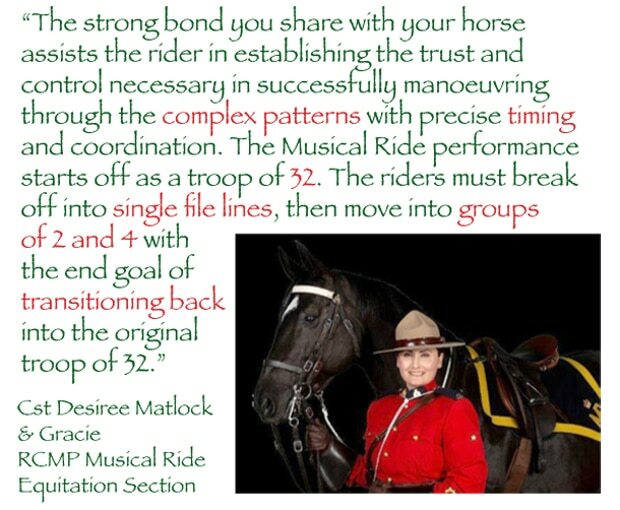 Assuming each horse gets ½ acre of space, if Caden’s dream equine centre devoted 25 acres to pasture and paddocks, how many horses would she have room for? Learning the anatomy of a horse’s leg. On the last day of camp kids had an in depth look at the anatomy of horses’ legs. They examined preserved specimens of sectioned hooves, sectioned limbs, figured out how to assemble the bones of a forelimb and hindlimb using diagrams for reference, and also examined the bones of the neck, an arthritic hip joint, and a fractured bone! Science Talk – anatomy: the branch of science concerned with the bodily structure of humans, animals, and other living organisms, especially as revealed by dissection and the separation of parts. Out of the 205 bones that make up a horses entire body, 80 of them are located in the legs! 7. 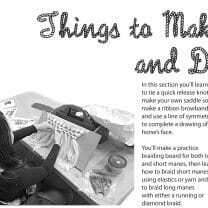 What percentage of bones in a horse’s skeleton are found in the legs? The distal limb bones are the foundation of a horse’s lower leg. The distal limb is everything below the knee (in the front leg) and the hock (in the hind leg). There are nine bones total in the distal area of each leg, and each plays a vital role in movement and stability. Three of the bones are inside the hoof! 8. Out of the 80 bones found in a horse’s legs, how many are distal limb bones? Taking an Xray of a horse’s leg. Xrays were taken of one of the BAEC horses (Sammy), to demonstrate the process of shooting radiographs and to show what arthritis looks like on an xray and what it feels like on a horse’s leg. Kids practiced their palpation skills by handling random objects which had been wrapped in towels. By feeling through the towels and describing what they felt, they got a sense for the art of palpation of tissues and the bones underneath. Science Talk – palpation: the process of using one’s hands to examine the body. Did Caden have a great time at this camp? You bet she did! “I really enjoyed this camp and learning all about horses and veterinary science. I look forward to next year’s BAE camp!” she said. And so do we! Imperial Answer: (36 ft x 2) + (84 ft x 2) = 72ft + 168ft = 240 feet. The perimeter is 168 ft. Metric Answer: (11 m x 2) + (26 m x 2 ) = 22 m + 52 m = 74 m. The perimeter of the barn is 74 metres. Imperial Answer: 36 ft x 84 ft = 3024 sq ft. The area of the barn is 3024 sq ft. Metric Answer: 11 m x 26 m = 286 sq m. The area of the barn is 286 sq m.
Imperial Answer: 84 ft ÷ 12 ft = 7. You could fit seven 12 ft stalls in 84 ft. Metric Answer: 26 m ÷ 3.7 m = 7.03. You could fit seven 3.7 m stalls in 26 m.
Answer: 25 ÷ 1/2 = 50. Caden would have room for 50 horses! Answer: 80/205 x 100% = 30%. Thirty percent of the bones in a horse’ body are found in the legs. Answer: 9 x 4 = 36. There are thirty-six distal limb bones all together.